The poet Miyazawa Kenji (1896-1933) was an early twentieth-century Japanese modernist who today is known worldwide for his poetry and stories as well as his devotion to Buddhism. 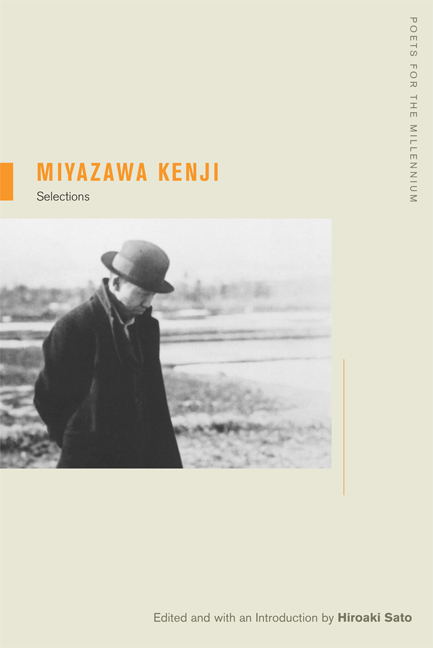 Miyazawa Kenji: Selections collects a wide range of his poetry and provides an excellent introduction to his life and work. Miyazawa was a teacher of agriculture by profession and largely unknown as a poet until after his death. Since then his work has increasingly attracted a devoted following, especially among ecologists, Buddhists, and the literary avant-garde. This volume includes poems translated by Gary Snyder, who was the first to translate a substantial body of Miyazawa’s work into English. Hiroaki Sato’s own superb translations, many never before published, demonstrate his deep familiarity with Miyazawa’s poetry. His remarkable introduction considers the poet’s significance and suggests ways for contemporary readers to approach his work. It further places developments in Japanese poetry into a global context during the first decades of the twentieth century. In addition the book features a Foreword by the poet Geoffrey O’Brien and essays by Tanikawa Shuntaro, Yoshimasu Gozo, and Michael O’Brien. Miyazawa Kenji (1896-1933) was one of Japan's most important experimental poets. His first book of poems, Spring and Asura, was published in 1924. Hiroaki Sato is a translator and essayist living in New York. He writes a monthly column for the Japan Times.